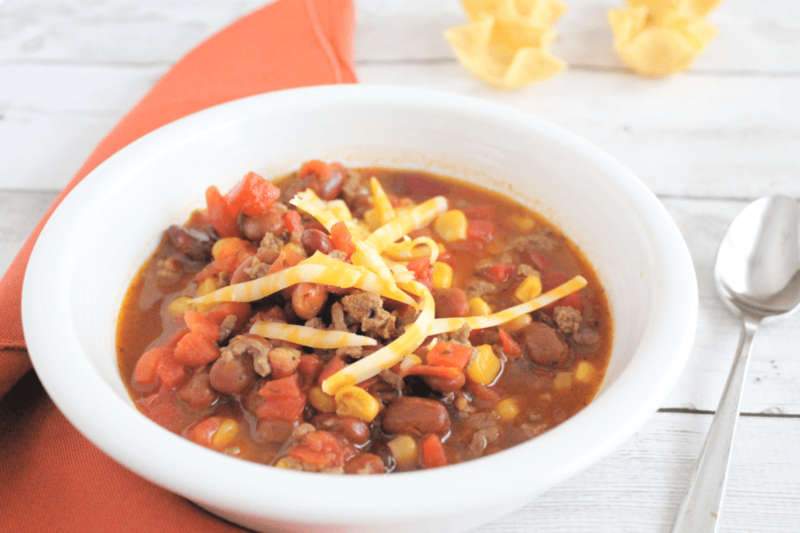 Pressure cooker taco soup is an easy, hearty meal your family will love! 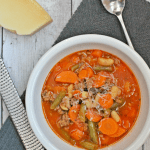 Instant Pot soup recipes are a great way to get a delicious meal on the table quickly. For many years, the slow cooker was my best friend in the kitchen. As a newlywed, I was a high school teacher and didn’t have a lot of time in the evenings to cook meals. Later, I became a nurse, which meant I was working shifts that were at least 12 hours long (though most nurses know we rarely get to leave on time! ), so getting home at 8pm meant that dinner needed to be already cooking. Then you add small kids to that, and the slow cooker was even more important for easy dump and go meals. 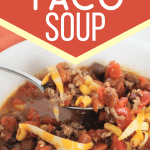 Taco soup was one of the first meals I started making in my slow cooker. 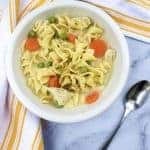 I loved it because it was super easy and frugal, and it could feed a crowd easily. 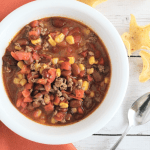 It’s pretty similar to a chili, using beef, beans, corn, and taco seasonings. 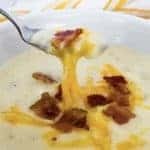 I love it paired with some corn chip scoops and shredded cheese–so good!! 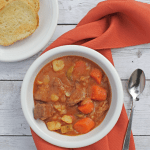 It’s one of those soups that leaves you longing for cooler weather and shorter days. And the best part is that it’s incredibly easy! 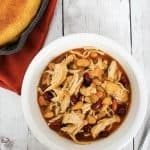 I still love my slow cooker, but these days, I find myself converting most of my favorite slow cooker recipes to pressure cooker recipes. The main reason is that it’s even faster! I don’t have to remind myself to put everything in the slow cooker early in the day when the Instant Pot will do the same thing in a fraction of the time. 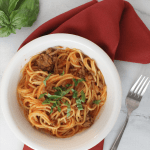 I’m including directions here for both methods of preparation, so if you don’t have an Instant Pot, you can use your slow cooker! 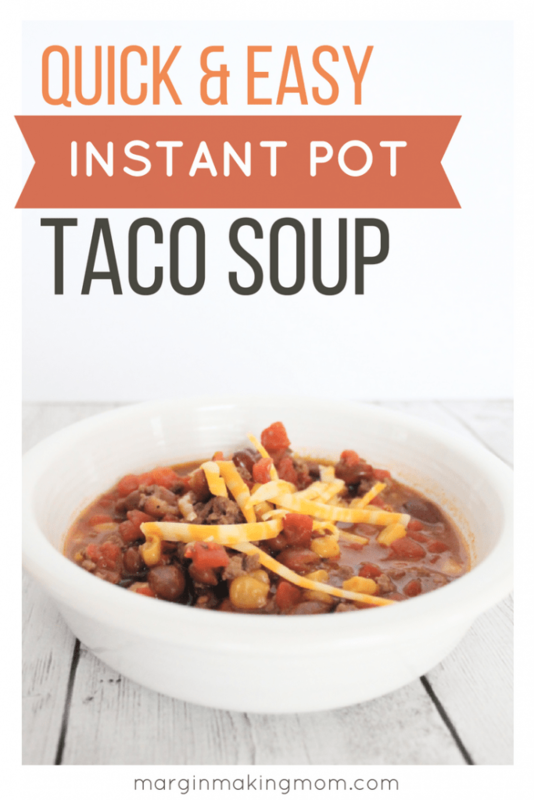 But if you do have an Instant Pot, the soup tastes just as good as if it were simmered for hours, only it wasn’t! Begin by browning some ground beef, using the Saute function of your Instant Pot. Once it’s browned, turn off the Instant Pot. Add all of the remaining ingredients and stir well to combine. Select a cook time of 3 minutes at high pressure using the Manual/Pressure Cook button. After the cook time has completed, you can either allow a natural pressure release, or you can allow a 10-minute natural release followed by a quick release. Voila! Brown the ground beef in a skillet over medium-high heat. Once browned, add to a slow cooker along with all other ingredients. Stir to combine well. Cook on the Low setting for 6-8 hours. 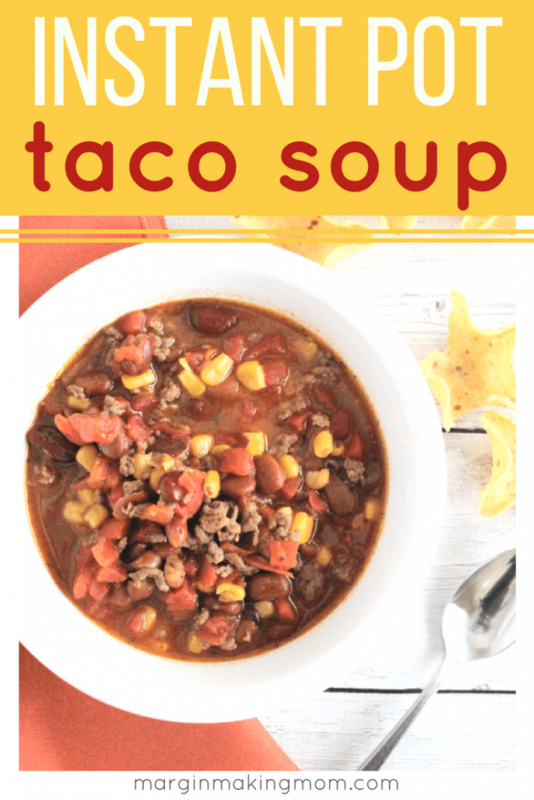 Give it a try–I’m sure you’ll love this pressure cooker taco soup for its deep and soul-warming flavor, the ease of preparation, and the fact that it’s the perfect weeknight meal! Add ground beef to the insert pot of an Instant Pot. Using the Saute function, brown the beef, breaking it apart with a spoon or spatula as it cooks. Once beef has cooked, press the Keep Warm/Cancel button to turn off the Saute function. Add all remaining ingredients to the insert pot, stirring to combine well. Place the lid onto the Instant Pot and set the vent to the sealed position. Using the Manual/Pressure Cook function, select a 3 minute cook time at high pressure. Once cook time is complete, you can either allow a natural release until all pressure is released, or you can perform a 10-minute natural release followed by a quick release of remaining pressure. After the pressure has released and the valve has dropped, carefully remove the lid. Stir and serve! Brown beef in a skillet over medium-high heat. Drain excess grease if necessary. Combine beef and all other ingredients in a slow cooker, stirring to combine. Taco Soup sounds delicious. I have a roast that can be cut in small cubes and added instead of ground hamburger. Great idea, Cindy! That would be delicious!